Networking specialists ELC Lighting and Green-GO Communications will be presenting developments to their product ranges at LDI, in conjunction with StageLight, on booth 321 from the 22nd to 24th November at the Las Vegas Convention Center, Las Vegas, Nevada. New software from ELC, derived from continuing experience gained through working on live events, is now available as dmXLAN v4. This completely revised freeware program for Windows and OSX recognises that managing the Ethernet network on live events has become a specialist role within the technical team in recent years. ELC’s software engineers often freelance on shows where they take responsibility for maintaining the integrity of data networks that distribute data for lighting, automation, LED screen and communications to distributed areas of the rig and dmXLAN v4 is the tool designed to do that job. Version 4 of the program has a new user interface and builds on the core network overview and remote setup of Ethernet switches and lighting components. 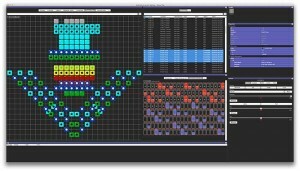 New features include a full implementation of RDM, multi-universe merging (three universes may be merged on each DMX output port, and re-transmitted as a single universe), merged universe can be programmed as a full softpatch for each channel, merge functions such as a soft changeover between desks or a media server can be controlled by a DMX channel. Another great feature is that dmXLAN v4 can be remotely controlled and monitored via a web browser on a smartphone. 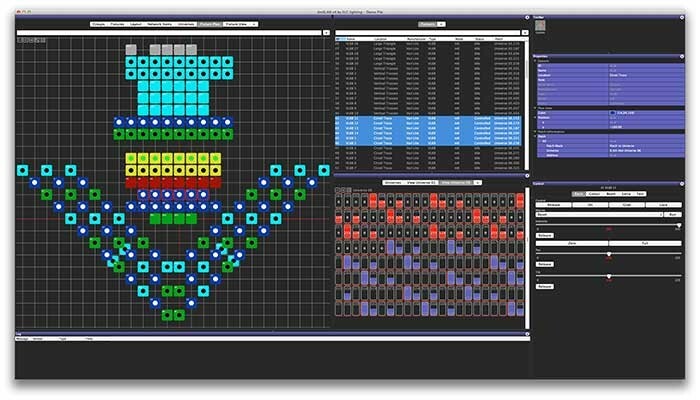 PLASA’s Lori Rubinstein has informed ELC Lighting that the dmXLAN v4 Software is one of just eight finalists in the sixth annual “Rock Our World Awards”, to be presented at the PLASA Cocktail & Awards Reception at LDI 2013. The Rock Our World Awards were created to honor ground-breaking achievement by PLASA members and to acknowledge the genius of both the creator of the technology and the designer or integrator who applies it in a real world environment. Winners will be selected by a panel of industry judges and be announced at the PLASA Cocktail & Awards reception on Thursday, 21 November from 5:30-7:30pm at the Las Vegas Hotel during LDI 2013. Joining the now established Ethernet networks for entertainment systems, ELC Lighting will debut a new and faster switch component. The new Switch8GB forms the backbone of the network distribution system. With 8 ports Local Area Networks have speeds of 10/100/1000 GB, plus a fiber optic option is introduced on ports 7 and 8. Thanks to the multiple back up loop feature there is fast recovery of back up data in the event of a cable problem. Another smart feature that is sure to be appreciated is the ability for each Ethernet port to be easily assigned to different VLAN networks, for example keeping lighting control networks separate to audio networks. The Switch8GB is totally compatible with ELC’s dmXLANv4 system management software. Also featuring at LDI 2013 will be the much applauded, award winning Green-GO communications system, Offering many of the features only previously available in expensive matrix systems, Green-GO is a cost effective solution embracing intercom, cue light, show relay and text messaging that is scalable from just two users to more than 3,000! Green-GO offers a digital intercom system over Ethernet with 32 full duplex channels and no requirement for the expense of a master station or central matrix, as matrix information resides in each single unit, belt pack or wall station. There are savings too by avoiding the need for dedicated cabling as it can be run over most commonly used protocols such as ArtNet, ACN or even the office network. Green-GO which won the 2012 Rock our World Award is fast becoming a favourite for production teams from theatre to TV studio production, stadium concerts and grand opera – in fact any live event where precise timing is essential and clear communications between directors and equipment operators is critical. Visitors to ELC Lighting and Green-GO Communications on booth 321 will have the opportunity to see the systems in use and discuss specific user requirements directly with the technical team. And for those less familiar with lighting protocol over Ethernet, or Ethernet based communications, there will be useful guide booklets available at the show.